I was about to start typing "ever since I was around fourteen and discovered 'What's In My Bag' videos on YouTube I've loved knowing what others tote around with them", but come to think of it, I've enjoyed a little nosey ever since I was a little girl. The endless fascination I had with my mum's dressing table led to shamelessly asking my auntie if she'd let me rifle through her makeup bag aged seven, and that interest in what other women deem worthy of never leaving the house without has never changed. As a beauty enthusiast, at least a few products are never far away and first up is a concealer that's both high-coverage, non-drying and easily-blendable, as I'm not always organised enough to remember a brush so fingers have to suffice and carrying separate formulations for dark circles and blemishes is a no-no. Thanks bareMinerals bareSkin Serum Concealer (I use the shade 'Fair' in winter) for being totally faff-free! 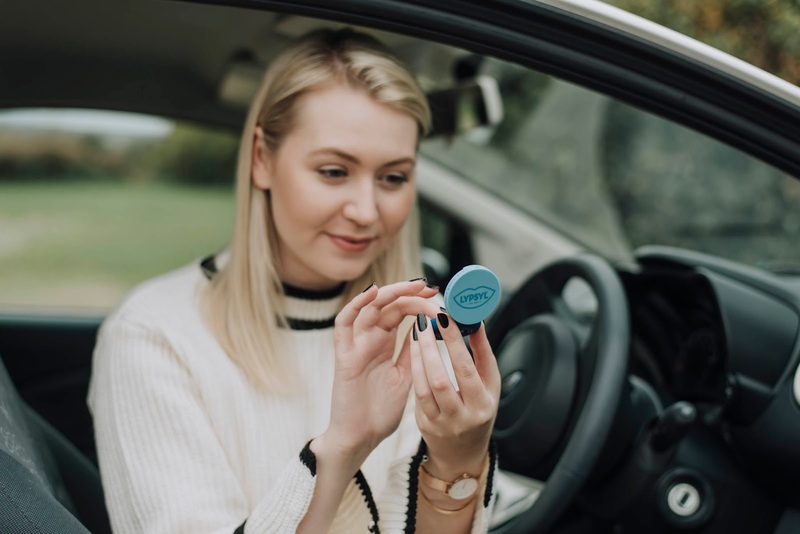 Secondly, I do tend to get a little bit antsy if I don't have lip balm to hand as it's an absolute staple in my daily routine and it's no fun to be stuck with dry, chapped lips without relief, especially at this extra chilly year of year! 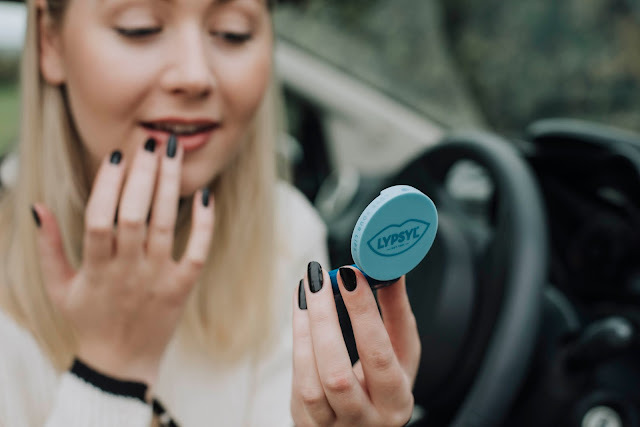 Licking your lips feels like it's doing something but actually dries them out more, so make sure you've got something like the new Lypsyl Soft Touch Mirror Compact with you - this ticks so many boxes for me as it's packed full of moisturising ingredients like shea and cocoa butter, vitamin E and aloe vera, it has SPF15 and comes in the cutest little easy-open handbag-sized compact with a generous 9g of product and a handy mirror to top it all off! The scent of Original reminds me of childhood (I know I'm not the only one who got sent to school with one of those iconic blue tubes in their coat pocket or pencil case!) although it's actually described as "a warm oriental fragrance with top notes of orange and lemon and white florals". My favourite is Luxurious Vanilla which smells like velvety caramel and leaves my lips super nourished, and you can also choose from juicy Zingy Mandarin and floral Fresh Orange Blossom. If you know me even a smidgen you'll know I'm a lip product gal through and through, and one I bang on about all the time (with good reason) is the Tanya Burr Cosmetics lipstick in 'Pink Cocoa' which is an expensive-looking tawny pinky brown that suits every occasion at any time of year. Check out 'Big Kiss' for a flattering and easy-to-wear deep berry red! Other beauty essentials include a glass nail file to smooth pesky jagged edges on the go, a mini hair brush to sort out the mess the wind/rain has made and a perfume sample. I'm currently properly, PROPERLY obsessed with Glossier 'You' (you get a free sample with every order, get 10% off with this link: http://bff.glossier.com/gH3Zm) as it's the most sultry, warm and cosy scent. The Zoella Beauty Snowella We're On A Roll set also has three very different fragrances in rollerball form which is perfect for your handbag. As for life-y bits and bobs, I never go anywhere without my Luxemono Spectra Card Case as it holds everything I need (debit card, driving license, Nando's card etc - you know, the essentials) along with an extremely useful zip compartment for train tickets and loose change, and you can also get it personalised with whatever you like... mine, really originally, says MEG. A portable charger is my handbag's best friend as I'm constantly draining my phone battery what with all of the emails and Instagram-scrolling and Spotify-listening, and even though my eyesight isn't awful I always make sure I've got my glasses in case I decide to catch a movie or I'm driving (car/house keys come along for the journey too, obvs). Chuck in some period supplies (I'm currently using Veeda as their tampons and pads are made of 100% natural cotton and they have an eco-friendly focus), some Merci Handy sanitiser and a good hand protectant like the Jurlique Rose Hand Cream, and you're good to go out into the world with an extremely tidy handbag and everything you could need! What are your handbag essentials? 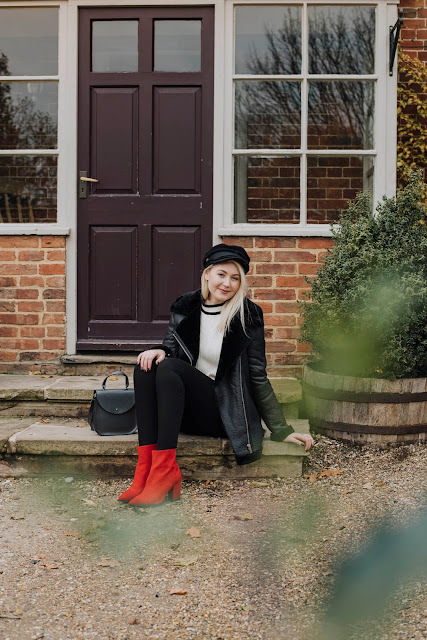 Do let me know what kind of 'handbag size' person you are also - I always used to carry a huge tote with everything plus the kitchen sink in it, whereas now I go for a smaller version and focus on the essentials. Fun fact: my mum brought me a cup of tea five minutes ago and when I said I was writing about lip balm she replied, "ooh I do love Lypsyl, I've always got one of them in my pocket, I used to buy multipacks for you and your brother to take to school as well!" This post is sponsored by Lypsyl. All opinions and words are 100% my own and honest. Some affiliate links have been used. For more information, please see my disclaimer here.